Fuel decision-making with your passion for data analysis. 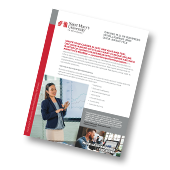 You can ignite your career in just one year with Saint Mary’s University’s online Master of Science in Business Intelligence and Data Analytics (MS BIDA) degree. This experiential program delivers data governance and visualization skills that hiring managers notice immediately. In it, you’ll use a combination of real-time big-data sets from Fortune 500 companies and the tools needed to navigate this complex environment. With them, you’ll discover the causal relationships between circumstances that effect the bottom line, present challenges at hand, and propose successful solutions to all stakeholders using quantifiable data. No less than three times throughout the year-long program, your work will be critiqued by a panel of experts — again from Fortune 500 companies — providing insight and exposure to your rapidly growing skill set. —Michael Ratajczyk, Program Director, MS BIDA. The 36 credit online MS BIDA degree from Saint Mary’s University quickly elevates your decision-making and presentation skills and abilities to work with big data sets — delivering a rare blend of proficiencies that organizations immediately take notice of. The affordable tuition includes a wifi-enabled iPad to help you complete coursework on your time. This gives you the utmost flexibility that online learning can offer — you can complete your coursework anywhere, and on your time.